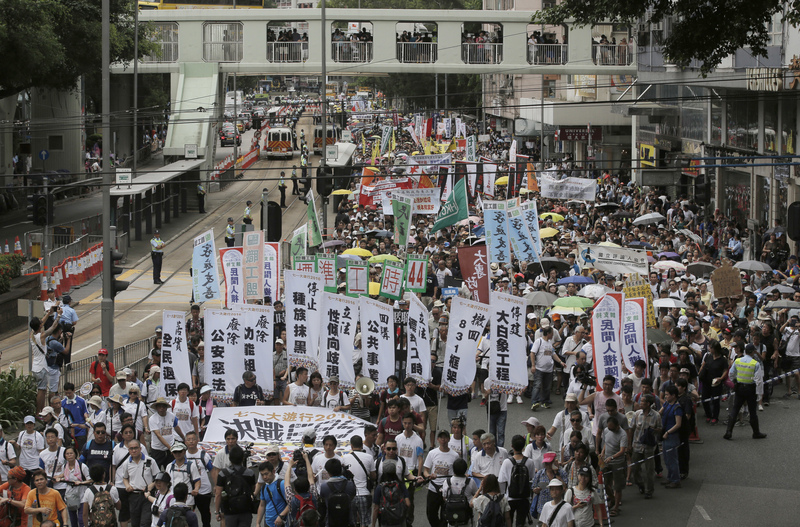 Hong Kong - Tens of thousands of Hong Kongers took to the southern Chinese city’s streets for an annual pro-democracy protest march Friday, as tensions persisted over the high-profile case of a bookseller secretly detained in the mainland. 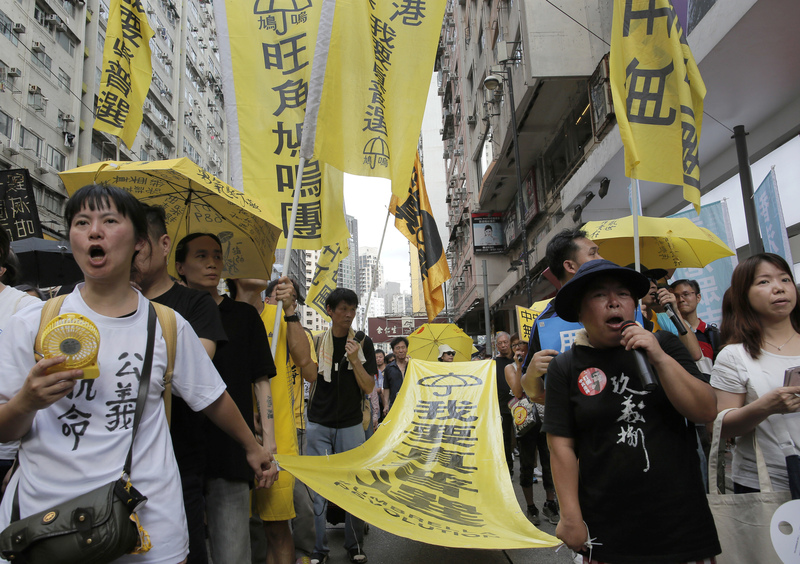 Protesters waved placards calling for Hong Kong’s independence from China and signs with photos of the bookseller, Lam Wing-kee, whose revelations last month about his ordeal rekindled concerns about Beijing’s tightening grip on the semiautonomous city. Lam is one of five booksellers who went missing for months only to turn up later in mainland China, either detained or involved in investigations. Their disappearances sparked international concern that Beijing was eroding Hong Kong’s considerable autonomy and rule of law. Lam returned to Hong Kong last month on the condition he provide information to Chinese authorities about buyers of the gossipy tomes on China’s Communist leadership that his company specialized in. But he defied the orders and instead spoke out about his ordeal of being detained secretly on the mainland. He was invited to lead this year’s procession but backed out hours before it began over safety fears, organizers said. Albert Ho, a pro-democracy lawmaker who has been assisting Lam, said the bookseller noticed he had been followed by strangers the last two days. “He feels increasingly concerned about his own personal safety so he made up his mind and decided not to attend,” Ho said, adding police had been notified. He said the identities of the people following Lam were unclear. From Victoria Park, protesters set off in sultry heat on a route along streets lined with hundreds of police officers that ended at city government headquarters. They called for Hong Kong’s unpopular Beijing-backed leader, Chief Executive Leung Chun-Ying, to step down and for the Chinese government to grant the semiautonomous city full democracy. Organizers said 110,000 people attended, while police there were 19,300 at the peak. The event is held on a holiday marking the day Beijing took control of Hong Kong in 1997 after more than a century and a half of British colonial rule. Lam’s revelations add to growing fears that Beijing is clamping down on Hong Kong’s civil liberties such as freedom of speech and eroding the “one country, two systems” principle governing mainland China’s relationship with the city. Billy Leung, a charity worker, said it was important to join the protest to voice anger over Lam’s case. “The fact that he and others were so blatantly made disappeared should be an alarm for everyone in Hong Kong. If you have a critical mind and you start criticizing what you think is not correct and not right, it could very well be you next time,” he said. May these protestors be MATZLIACH against the Red Chinese Communist dicatorship.